Environmental tracers are natural or man made (anthropogenic) compounds or isotopes that are widely distributed in the near-surface environment. Variations in their quantities can be used to determine pathways and timescales of environmental processes. They include naturally occurring isotopes such as carbon-14 and anthropogenic tracers such as Chlorofluorcarbons (CFCs). Releases of anthropogenic environmental tracers include catastrophic events such as nuclear bomb testing releasing, as well as gradual leakage of tracers from industrial production processes. Groundwaters residence times in the investigated reference aquifers range from a few years up to many thousands of years. For these time scales, dating using tracers relies on substances which were already present in the geosphere at the time of recharge. Such "environmental tracers" are of natural origin for old groundwaters and, in general, a result of human impact for waters infiltrated within the last 50 years. The dating range of a method is given by the characteristic time scale on which the tracer concentration varies over time. Half-live, input function or accumulation rate are the main characteristics of a tracer which determine the residence times on which a tracer is most sensitive. E.g. the radioactive isotope 39Ar with a half-live of 269 years and a constant initial activity is an ideal tracer for groundwater residence times in the order of 100-1000 years (0.3-3 half-lives). A whole set of tracers is therefore required to cover the entire age range of an aquifer or a set of different aquifers. The most important applied tracer methods with the corresponding timescales are presented graphically below. 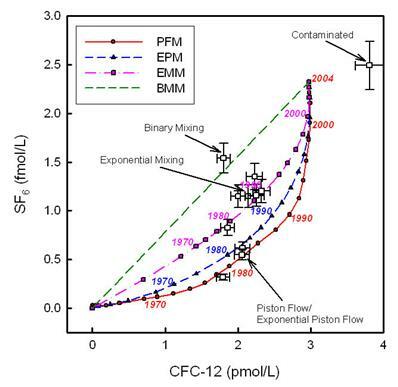 CFCs and sulphur hexafluoride (SF6) are particularly useful for dating groundwaters less than 100 years old. Water extracted from a borehole or flowing from a spring is generally considered to be a mixture of waters from all the flow lines reaching the discharge point. The age frequency distribution and mean age of the mixture affect the interpretation of the groundwater dating methods as well as the interpretation of other groundwater solute fluxes. Groundwater dating with CFCs and SF6 is possible because a) concentrations have been building up in the atmosphere at a known rate since the late 1930s and early 1970s respectively b) like all gases, they have a characteristic solubility in water (based on Henry's law) and the dissolved concentrations in rainfall maintain a unique signature of the atmosphere at that particular time, thereby providing a date for the event and c) concentrations in air and young water are high enough to be measured. As the atmospheric environmental tracers considered here have differing temporal patterns to their input functions, plots of one tracer against another can be used to distinguishing hypothetical groundwater mixing processes that may affect the samples, in addition to identifying anthropogenic contamination. 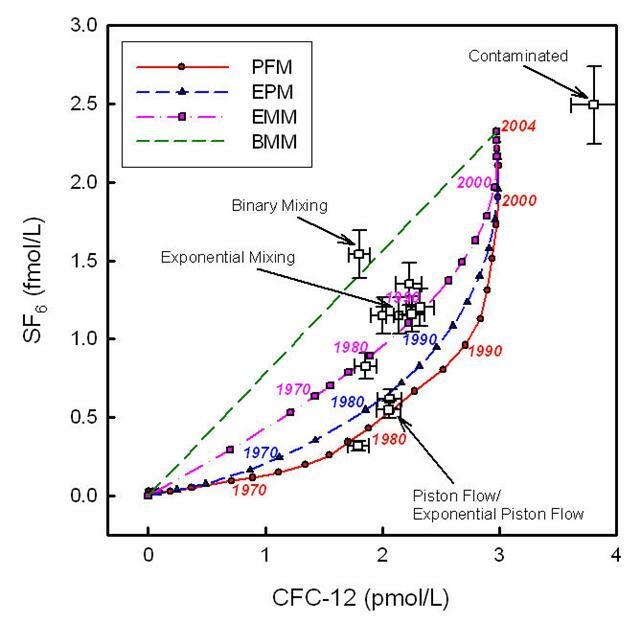 There are four hypothetical mixing models that can be typically used to describe some of the variation seen in groundwater mixtures: piston flow (PFM), exponential piston flow (EPM), exponential mixing (EMM) and binary mixing (BMM). In some cases, water reaching the open interval of a borehole or discharging from a spring is nearly uniform and can be approximated with a piston-flow model, analogous to water flowing through a pipe from the point of recharge to the point of discharge without mixing during transit. The exponential-piston model corresponds to a situation in which an aquifer receives distributed recharge in an up-gradient unconfined area, then continues beneath a down-gradient confined area. Exponential mixing can be used to describe discharge from an unconfined aquifer receiving uniform areal recharge. Binary mixing of young water with old (pre-tracer) water is one of the simplest models to consider and is perhaps the most important in many fractured-rock environments although not all. In binary mixing, simple dilution occurs because the old fraction is assumed to be free of the tracer and, consequently, the age of the young fraction can be calculated from the ratio of the two tracers. Darling W G, Morris B, Stuart M E and Gooddy D C. 2005. Groundwater age indicators from public supplies tapping the Chalk aquifer of southern England. Water Environment Journal 19, 30-40. Morris B, Stuart M E, Darling W G and Gooddy D C. 2005. The use of groundwater age indicators in risk assessment to aid water supply operational planning. Water Environment Journal 19, 41-48. Gooddy D C and Darling W G. 2005. The age of the Rain. Planet Earth. Autumn 2005, p32. Morris B L, Darling W G, Cronin A A, Rueedi J, Whitehead E J and Gooddy D C. 2006. Assessing the impact of modern recharge on a sandstone aquifer beneath a suburb of Doncaster, UK. Hydrogeology Journal 14, 979-997.